The 2015 Isle of Man TT RST Superbike race finally got underway on Saturday afternoon in near-perfect conditions. The thrilling six-lap race saw Honda Racing's John McGuinness place fourth overall, while team-mate Conor Cummins was unfortunately forced to retire. It was a mixed race for McGuinness who, after setting off first round the 37.73-mile Mountain course, suffered with visibility issues when he lost his visor tear-offs during lap one. Coming into the first pit stop at the end of lap two, the 'Morecambe Missile' was still leading on the road, but a suspected problem with the fuel filler meant he and his crew lost vital time and he dropped back going into the third lap. 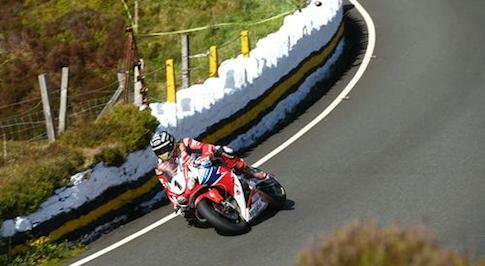 During the remainder of the race, McGuinness pushed hard on the Honda CBR1000RR Fireblade SP, making up time to close the gap on the leading pack. Although the second pit stop at the four-lap mark was quicker than the first, the suspected fuel filler issue still hindered progress in the pits. The Honda man eventually crossed the line fourth, 13-seconds behind the third-placed rider James Hillier. McGuinness: "That's one down with the Superbike race; I set off number one and went as fast as I could. It's going to sound like an excuse, but I lost my tear-offs at Crosby on the first lap and struggled to see where I was going, there were also a few sprinkles of rain about, which was a bit sketchy. Hillier came past me and I managed to stick with him and then re-passed him again. I came into the pits and I think we had the slowest fuel filler there! It was a nightmare; I came in in front of them, and went out six seconds behind Hillier and had to catch him back up again." He added: "It was an eventful race, but I did my best and I'm not too disappointed finishing fourth, of course I would have loved to have stood on the podium, but I couldn't do any more than my best, which was fourth place. We have the Senior TT at the end of the week, I'm going to sit down with the team and have a look where we can make better, and have another go on Friday." The race was won by Bruce Anstey aboard the Padgetts Motorcycles Honda CBR1000RR Fireblade.